Do I find writing to be a joyful experience? Short answer: yes and no. Yes, there are times when it’s difficult, times when I’d rather be anywhere other than at the writing desk, and times when I think I’m kidding myself about being able to write anything worth reading and that I should pack it in. BUT those negative times are relatively rare. And no matter how bad the writers’ block or the procrastination or the self-doubt might be, I honestly can’t imagine not doing it. It’s vital for my health and wellbeing, it’s my purpose and my passion. The everyday, practical, non-fiction type of writing – that is the lists, the lists about lists, the problem-solving mind maps, the journaling and the diary keeping – all help me work through problems, get organised and make decisions. And when things are getting a bit too much – during times of stress, anxiety or depression – writing, for me, has really come into its own. At times like these writing, in the ways mentioned above, has been therapeutic and helped me find my way through and out the other side. As for the professional side of my writing – the creative, imaginative stuff that I do – well, that’s where the real joy comes in. I love setting out with one or two characters and finding out from them what their story is. For me, writing a novel truly is a joyful voyage of discovery. Those first one or two characters introduce me to more characters along the way. They reveal where they live and they share their problems, dilemmas and challenges with me. I love fleshing out the characters, creating the details of their homes and daily lives, providing the backdrop and landscape in which their stories take place. I also enjoy getting them out of the difficult or maybe even life-threatening positions I’ve put them in. And it’s wonderful – if sometimes inconvenient – when having hit a metaphorical wall in a work-in-progress, the solution suddenly comes to me unbidden – when I’m in the shower, when I’m about to fall asleep or when I’m out walking. But inconvenient or not, I love it when my sub-conscious mind takes care of the difficulty. Then there’s the buzz of seeing the finished article, of holding the book I’ve created in my hands. There’s nothing like it. Apart, that is, from the even greater buzz when a reader tells you they loved it. And it’s most certainly not about the money earned – although that’s helpful – but as long as at least one person reads and enjoys my made-up stories – probably even if that’s just me – I’ll keep on doing it. Yes, writing truly is an essential joy. So, what is your passion – is it writing or something else? What drives you to pursue it? Can you imagine your life without it? I love reading. I read both fiction and non-fiction and enjoy various genres. Romantic fiction is my favourite, with crime fiction a close second, but I also read the occasional historical novel too. And when I write my own books I write the sort of book I would want to read. My novels are essentially romances with lots of other themes/issues woven into the mix as well. And one thing that struck me early on in my writing career was that in romance in particular the main characters in the popular novels I read were mainly young – i.e. in their 20s or 30s. But I wanted to write about characters who were a bit older than that. So I was delighted to get the chance to explore this notion of age in fiction when I wrote a guest post for Linda’s Book Bag blog on this very topic. You can read the post on Linda’s wonderful book blog here. This is the second of two posts where I share a bit about why I chose the theme of displacement for my novel of the same name. In the first post I talked about physical displacement – displacement from home and country. In this post I’m going to look at the emotional aspects explored in the novel. Rachel, one of the two main characters, is a fifty-something woman. She lives alone on the Isle of Skye, one of the Hebridean islands off Scotland’s west coast. Her home is on a small farm, or croft as it’s called in the Scottish highlands. And as well as looking after her sheep, she also works as a children’s book illustrator and writer. Rachel has been through a lot of upheaval in her life––divorce, grief after the loss of her soldier son, killed in Afghanistan, and then as the story begins, the loss of her mother who she’s been living with and caring for. And the other main character, is newly retired Edinburgh police detective, Jack. He’s coming to terms with his retirement, has just had heart surgery, and is feeling stuck in a relationship that has run its course. Like Rachel he is divorced. At the start of the novel he has just bought a rundown cottage in the (fictional) Skye village of Halladale. He plans to do it up and to use it as a holiday home. Both Rachel and Jack have lost their way emotionally. Both of them need to come to terms with the changes in their lives and to find a new way of living. During the course of the novel both of them explore new ways of life. Rachel goes to Israel-Palestine, where her brother lives. She wants to explore her Jewish heritage and to see if she too can settle and make a new life in the Middle East. And the people she meets there certainly open her mind to new ways of living and new possibilities. There’s Hana, a Palestinian woman who owns a guest house on the West Bank where Rachel spends a few days. The conversations Rachel has with Hana are life-changing. And then there’s Eitan, an artist, and best friend of Rachel’s brother. Eitan reawakens in Rachel what it is to be a woman and a person in her own right––not just a mother, daughter or ex-wife. Jack meanwhile finds working on his cottage to be therapeutic. He also finds walking in and photographing the stunning Skye landscape provides him with time and space to decide what’s next now he’s retired. And then there’s the relationship between Rachel and Jack. They establish a strong friendship before Rachel leaves for Israel and it’s a friendship that benefits both of them emotionally. But there’s also a complication––an undercurrent that both of them sense but neither acknowledge––they are strongly attracted to each other. Beginning a new relationship isn’t something either of them wants and it’s this emotional complication that drives the narrative of Displacement forward. At its heart Displacement has the question of whether Jack and Rachel can become new anchoring points in each other’s previously turbulent lives. 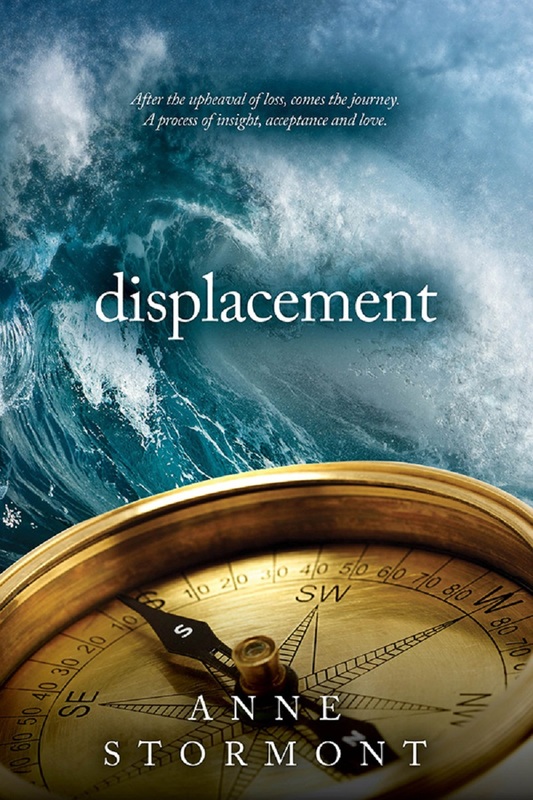 When I wrote Displacement, I wanted to explore what knocks people’s lives off course, what pushes them out of their normal place and space. I also wanted to examine the consequences of both physical and emotional displacement. In other words i wanted to look at what happens when people are forced by circumstances to change their location – both external and internal. At the emotional level, I wanted to explore the displacement caused by grief, betrayal, illness and ageing and I’ll share more of the background to this in a subsequent post. But I also wanted to explore the long term consequences of physical displacement, of what happens when people are forced to abandon their home and culture in order to stay alive – and that’s what I’m looking at in this post. When I came to write Displacement, three examples of the forced movement of people were in my mind – two from the relatively recent past, and one that has existed since the 1940s and continues to the present day. The first was the forced eviction of people from their land in the north of Scotland. The evidence of the Highland Clearances of the 18th and 19th centuries is still visible today. And this, combined with the earlier punitive measures put in place by the victorious Hanoverian side following the Battle of Culloden, meant that Gaelic culture came close to being eliminated. The wearing of tartan was outlawed as was speaking Gaelic. The organisation of Highland society by the clan system came to an end and thousands of Scots were forced to emigrate to Canada, America, Australia and New Zealand. The second example of the forced displacement of people that I had in mind was the much deadlier clearance of a whole culture that was wrought in Nazi Germany. I saw an item on Scottish television marking the 75th anniversary of the Kindertransport that took place just before the second world war. This happened when Great Britain agreed to accept 10,000 Jewish refugee children from Germany and Austria. The children were taken in by British families and most never saw their parents again as they died in the Holocaust. Some survivors of the Kindertransport were interviewed about their experiences of arriving in and growing up in Scotland in their adoptive families. Their stories of stoicism and survival made quite an impression on me. And the third example is that of the plight of the Palestinian people displaced from their homes by the establishment of the nation of Israel in 1948 following on from the end of the Second World War. I brought the three together in Displacement by making the late mother of the main female character, Rachel, a Kindertransport survivor who was taken in by a family in Glasgow and who later married a native of the Isle of Skye (in the Scottish highlands) and settled there. Rachel lives on Skye, but her brother has followed his Jewish heritage and emigrated to Israel-Palestine. And because of the significant emotional upheavals in Rachel’s life, she decides to visit her brother in his adopted homeland and see if she too can find a renewed sense of home by being there. Hence the action in the novel moves between these two very different places and addresses many layers and levels of displacement as Rachel tries to decide where in the world her future lies. And I was able to describe both settings from experience. I’m a Scot and I live in the Scottish Hebrides so I’m steeped in that environment and its history. The wild and often challenging landscape, the resilience and resourcefulness needed to survive here, and the still visible evidence of whole townships abandoned and left to crumble when the inhabitants were forced off their land – all lend themselves to the exploration of the themes of upheaval and displacement . I’ve also been to Israel-Palestine several times. It’s a country that fascinates me and it’s certainly no stranger to upheaval. My link with the Middle East dates back to when I was fourteen and to my high school days in Edinburgh. A new girl joined the class and I was the one who volunteered to look after her. The new girl was Revital and she was an Israeli. Her father was doing a PhD at Edinburgh university and had brought his family with him for the duration. Revital and I quickly became friends. So much so that after she and her family returned home we kept in touch and in 1975 during my long summer holidays from university I travelled to Israel to visit her. As she was doing her national service at the time we could only meet up at certain times, so I worked on a kibbutz for a bit and did a bit of travelling. The kibbutz was on the Golan Heights – something I didn’t tell my mother who was worried enough about me visiting what she saw as a very dangerous country. I wasn’t worried though; I had the invincibility of youth. And I was smitten by the place – its beauty, its ancient landscape and its vitality. ‘a volunteer organization of Israeli women who are peace activists from all sectors of society. We oppose the Israeli occupation in the area known as the West Bank, we oppose the appropriation of Palestinian land and the denial of Palestinian human rights. We support the right of Palestinians to move freely in their land and oppose the checkpoints which severely restrict Palestinian daily life. When I visited in 2012 I accompanied Revital on one of these checkpoint observations. It was a bit scary – I’ve not been that close to a soldier on active duty before or to an automatic weapon – but it was an interesting and enlightening experience. Palestinians, including the elderly, the sick, and the pregnant are given a lot of hassle while just trying to go about their ordinary daily business such as visiting family or attending hospital appointments. So all of the above was in my head as I wrote the novel and I incorporated some of my own experiences into the story – from Rachel’s life as a crofter to the realities of life in the Middle East. I’m not a historian, a politician or an activist, so I wrote simply as a human being reflecting on the plight of other human beings and on the injustices of enforced displacement inflicted by some of us on those we perceive as ‘other’. But, as I mentioned above, I’m only too aware of the plight of refugees from Syria right now as they try to get Europe. I’ve donated to charities and written to my MP – as I’m sure many of you will have – and I will continue to do whatever else I can to help, albeit in a small way. I’m particularly proud that my relatively small and remote community is, as I write this, collecting desperately needed items for those refugees and as soon as there’s enough to fill the articulated lorry that is on standby, these items will be driven to Greece for delivery to those who need them. We’ve been home now for four days. Our stint as booksellers-in-residence at the Open Book second hand bookshop is now over for the husband and me. It was a great adventure. We hope we’ve left the Open Book slightly tidier and the stock a bit better organised – having built on the hard work of our predecessors in the project. Now it’s over to our successors-in-residence to continue the process. 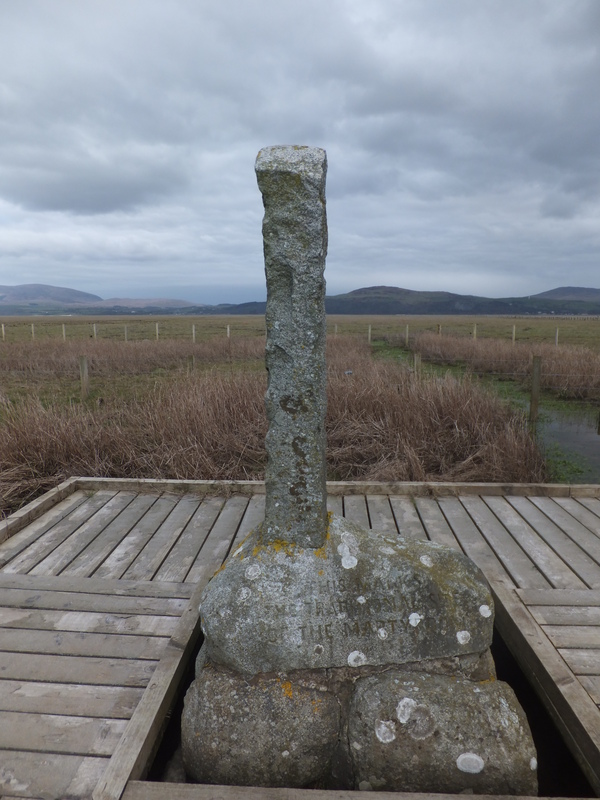 You’ll have seen from my earlier posts on our time in Wigtown that we met all sorts of interesting and lovely people – both local and visitors to the town. We did a bit of exploring of this corner of Scotland and liked what we saw. 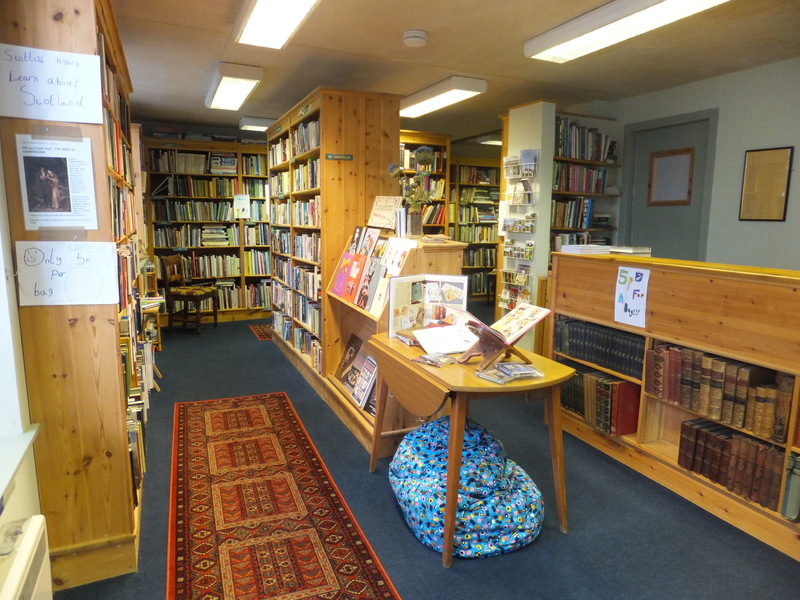 It was good to visit the other bookshops in Wigtown as well. How wonderful to have them all, and to have people who are so committed to selling real books in real independent shops and who are prepared to work so hard to do so. It was an eye-opener as to how much goes into running a successful bookshop and it’s definitely a labour of love. More power to all independent bookshops! During the fortnight, although there wasn’t a lot of spare time to write, I did get to do a bit of thinking and planning in connection with my writing. And I met several local authors and we shared experiences, thoughts and ideas – this in itself was such a valuable opportunity. So thanks to the Wigtown Book Festival Company and all those behind this unique project, especially to project manager, Anne for the chance to be part of the Open Book. Thanks, too, to Joyce from the Old Bookshop, to the owners of the Glaisnock Cafe, (yummy), to Jayne and to Sarah from the writers’ group, and to everyone else who made us so welcome. And most of all thanks to the Open Book shop. It was fun getting to know the best wee bookshop in the world. It’s a long drive from Scotland’s National Book Town to our home in the Hebrides, so we broke our journey north on Saturday with an overnight stay in Glasgow. 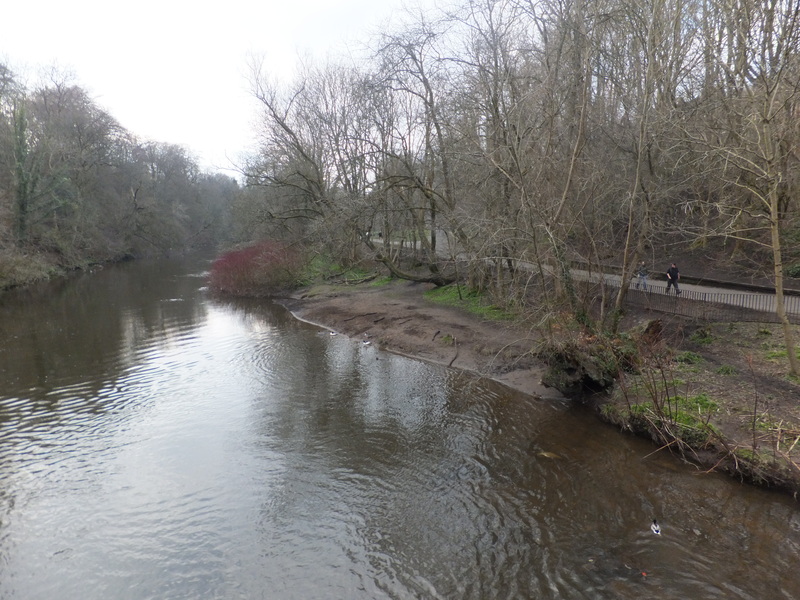 We stayed at a hotel in the city’s vibrant west end and so were able to enjoy a walk in the Botanical gardens and along the River Kelvin walkway, as well as a lovely dinner out at a nearby Italian restaurant. Then on Sunday we drove the rest of the way home. And what a drive home it was. It was a beautiful day and the west of Scotland was looking stunning. Loch Lomond, Glencoe, Kintail, to name just a few of the places, were all showing off their full glory – Scotland was at its most jaw-dropping and glorious best. It’s nice to be home. 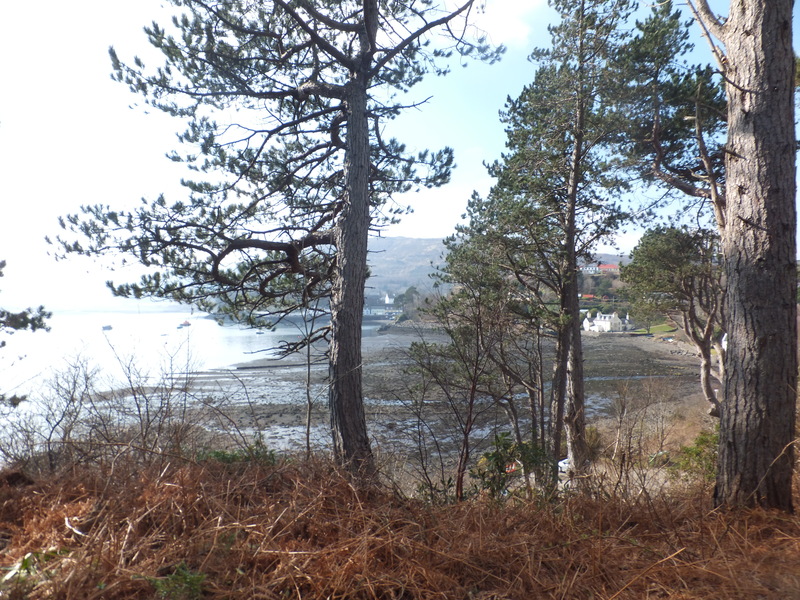 The weather has continued to be good and I’ve already had the chance to enjoy one of my favourite local walks. Since getting back, I’ve also been catching up on all my own writing jobs and looking to further the plans I finalised while I was away. There are two deadlines tomorrow. One is for my contribution to Words with Jam, the online writers magazine that I’ve been on the staff of since its inception around four years ago. The theme of April’s issue is History and I got two pieces off to the editor yesterday. The other deadline is for an application to be included in an opportunity being offered to writers by XPONorth. Below is an edited extract from the organisation’s publicity for the opportunity. XPONorth (Writing & Publishing) is delighted to offer seven independent, self-publishing authors living in the Highlands and Islands of Scotland, the chance to sell and promote their work at the Indie Author Fair 2015. The Fair takes place at Foyles Bookshop, London, on Saturday 17th April 2015. The Fair is part of the London Book Fair Indie Author Fringe Festival, run by The Alliance of Independent Authors/Indie ReCon, and Triskele Books are hosting the 2nd Indie Author Fair at Foyles Bookshop. Authors selected for the showcase will be offered support and mentoring in developing their marketing and promotional materials and platforms in readiness for the Fair. Indie authors living the Highlands and Islands can apply to participate in this showcase either to be present in person with their books at the Fair (books, plus promotional materials), or to have their books available on the XPONorth display forsale and with promotional materials. 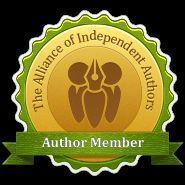 Whether for readers, writers, publishers or observers of the publishing scene, this will be an unmissable event – an opportunity to say hello to the best indie authors in the business, meet suppliers, talk to experts, buy/sell some books. The event will be FREE to the general public. My application is away. I’m not planning to attend in person, but it would be good to have my books promoted and on offer there, so fingers are crossed. Then, after I get home, it will be all systems go for the April publication of my first children’s novel. More of that in a later post. And here is my shortlisted story – see previous post for details about the competition I entered. The decline had been rapid. Within a few years, Riversdale had gone from being a thriving farming community, populated by lively and growing families to being an unsettlingly quiet and barren place. Now, the fields lay unploughed, withered and brown. Birds no longer sang in the sickly trees. The once, brightly whitewashed cottages with their red, pan-tiled roofs and pretty gardens stood neglected. Dark, paint-flaked windows, weeds choking and smothering the flower beds, children’s toys abandoned in the undergrowth – all told the story. But it was the empty school that made the starkest statement about what ailed Riversdale. One fine spring afternoon, Gretel sat on the schoolyard wall. She often came here to sit and think. She would stare at the deserted building with its sad black windows. She would try to imagine the schoolyard full of children as she’d heard it had once been. But she couldn’t. She had no idea what that would be like. Her twin brother, Hansel, jumped along a grid of faded, numbered squares that had been painted on the playground’s dusty surface. Gretel had once asked her mother about the grid of numbers. Her mother began to explain that it was a game, but she became too upset to finish the explanation and Gretel hadn’t asked again. Over by the school gate, Gretel noticed that the woman was there again. The woman came every school day – every school day at three o’clock – and she waited. She waited until her husband came to fetch her back at four o’clock and she listened – listened to him explain once again – as he always did. And she listened, every time as if it was the first time, to her husband telling her that their son wasn’t in school, that he would never be in school, that he was gone, taken by the Helpers. And every time she cried – as if it was the first time. Hansel and Gretel were taught at home by their mother. The teacher left when the last school age child had gone from the village. Gretel and her brother were babies at the time. It was the year after the river dried up and the crops didn’t grow. It was the year the Helpers came. Today, as she stared at the sad old building, Gretel wondered again what it would be like to go to school, what it would be like to be in a class full of other children her own age. She longed to be in a class full of other children. She longed to have other children, besides her brother, to play with. Hansel was all right – but he was a boy. He didn’t want to play Gretel’s games and he always seemed quite happy on his own. She wished she could have a group of friends – all girls her own age. Gretel did have one friend. She was called Lottie and she was the same age as Gretel. She was quite good company most of the time. She and Gretel talked a lot about all sorts of things. Lottie came for sleepovers and she was always there when it was Gretel’s birthday. ‘If only she was real,’ thought Gretel. Gretel had asked – begged – her mother to move the family to the town – to let her and Hansel go to the school there. After all, wasn’t that where the Helpers had taken the other children – to Forestville -to the town? But her mother wouldn’t talk about it, wouldn’t consider it. She would only say that their father said it was a dreadful place and that he wouldn’t allow it. He wouldn’t even let Hansel and Gretel visit the town. They’d never been to Forestville – not once. She’d also asked over and over again why the older children had gone. She’d overheard bits and pieces. Sometimes the grown-ups forgot she was there or thought she wasn’t listening. She’d heard her mother and grandmother talking, or sometimes it was her mother and Marta, the woman from next door. And some nights, when she and Lottie couldn’t sleep, Gretel would creep out of bed and sit at the top of the stairs and listen to her parents talking in the room below. One day Marta said to Mama, “Everyone says you’re so lucky. You’re so lucky that your Hansel and Gretel were babies when they came for our children – and so lucky that their father could find work in the town.” Gretel thought Marta sounded cross. And after Marta left, Gretel thought she heard her mother crying. Sometimes at night, as she sat on the stairs, Gretel heard her parents as they talked. Then, one night, they seemed to be arguing. Their voices were loud. Both of them sounded angry. “Do you think I like going there?” asked Papa. “I don’t understand,” said Mama. But it wasn’t long after that night that Mama broke her promise. Papa had arrived home from work early. Gretel was sitting at one end of the kitchen table drawing and Hansel was playing with his toy farmyard at the other end. Mama was preparing their evening meal. Papa almost fell into the kitchen he was in such a rush. He stumbled over to Mama, who looked very surprised, and hugged her. “Come here, children,” he called, gasping to catch his breath as he beckoned to Hansel and Gretel. The children ran to their father and he held them and Mama close. Papa let go of them and ran his hands through his hair. And now he looked scared too. Gretel wished that Lottie was with her. “What do you mean? Where will you go? What about your job? ” Mama was crying. Hansel was crying. Gretel was determined not to. Their father embraced them both quickly and then he was gone. At first their mother tried to keep things going as normal. But the longer their father was gone, the harder it got. The money ran out and, soon after, so did the food. Then, one morning as Hansel and Gretel shared the last slice of bread and their hungry Mama watched them, the Helpers arrived. It didn’t take them long to persuade Mama. They commented on how thin Hansel was and promised Mama he’d be fattened up. In fact, both the children would be fed and educated. In the afternoons they’d do some light work for the Helpers. The money they earned would be sent to Mama. It didn’t take Mama long to pack a little bag for the twins to take with them. The last children in Riversdale were leaving. Hansel and Gretel were going to Forestville. So, it’s onwards and upwards in 2013. I have the motive, means and opportunity – as the cops say of criminal masterminds –to succeed. Only in my case, I don’t plan to commit a crime – but to commit myself to what really matters in life – and especially to my writing. The blog pause is over and I promise I put my time away to good use. I did get some writing done but, with the small matter of Christmas to organise, perhaps not as much as I’d hoped. However, I’m not going to be too hard on myself. Last year’s mantra was ‘now’ but this year’s is ‘mind/don’t mind.’ By that I mean I’m only going to be mindful of the important stuff – the stuff that is worth paying attention to. The other stuff – guilt, pointless worrying, and other unimportant wastes of time – I’m not going to pay any heed to them. So, on that positive note, I’m not going to mind too much that a lot of time in 2012 had to be given over to family matters, health matters and moving house as well as to the ever-increasing demands of my fulltime teaching job. That was all as it should be. And in spite of all that stuff I did get a reasonable amount of writing done last year. I made progress with both novels-in-progress – my second adult one and my first one for children. I submitted my bi-monthly articles to the writers’ magazine ‘Words with Jam’. I also blogged almost every week. I made a new personal best, record number of sales for my novel ‘Change of Life’ and made it into Amazon’s women’s fiction bestsellers list – albeit briefly. Other good things from last year – I read some great books – many of them reviewed on here. I spent a lot of quality time with my wee granddaughter during her first year. In July I made my third visit to Israel and had an amazing time there – also recorded here on the blog. And the visit provided some valuable research for the grown-up novel. And 2013 has got off to a good start. 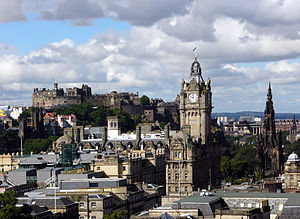 I spent a few days at New Year in my home city of Edinburgh. 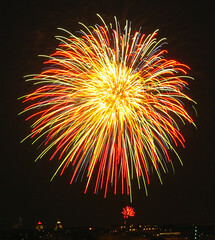 It was a lovely break made up of family, fun and fireworks. The city’s Hogmanay fireworks, which I viewed from the street outside my son’s flat, were an awesome and a fitting start for ‘WriteEnough’s’ year of living mindfully. I stayed with my son and his lovely partner and was thoroughly spoiled by them. I met with my sisters for a good catch up and spent some time with my elderly father and auntie. I spent a magical morning in Edinburgh’s Botanical Gardens, one of my favourite places in this city of many magical locations. I said hallo to the grand old Figus Sylvatica – one of three specimens of this magnificent silver-barked tree situated at the top of the Gardens. 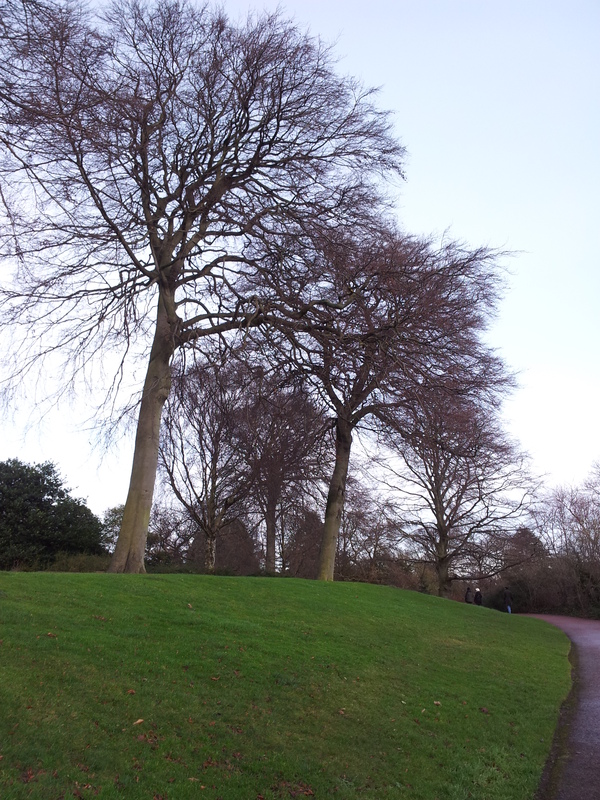 It is under this tree, looking out over the town that I would like my ashes to be scattered – but not for many years yet! 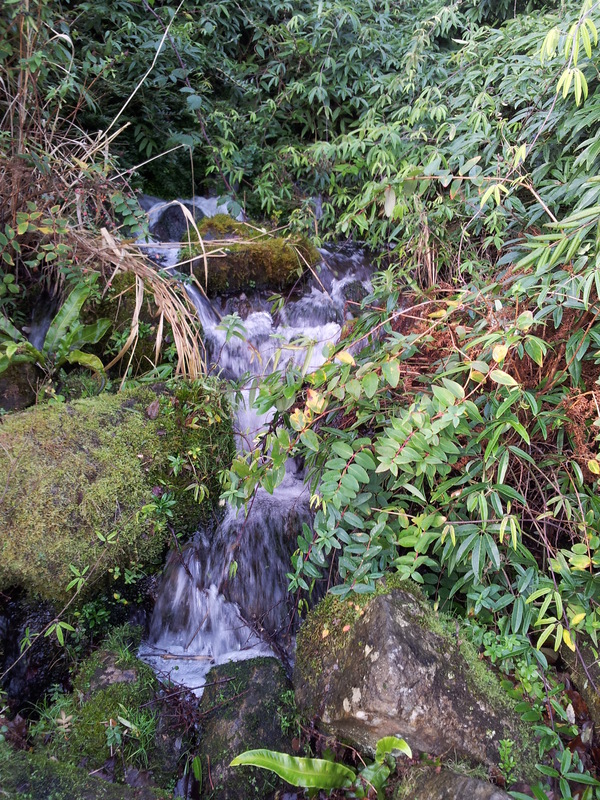 I spent some quiet time in the Chinese garden section, enjoying the sight and sound of the gentle waterfalls . And I sat on the bench where I used to go and sit when I was first diagnosed with ovarian cancer and needed to get my head round the fact that I was mortal after all. 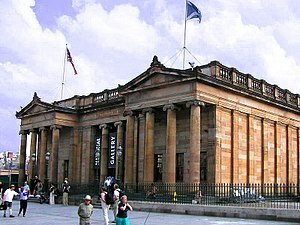 Another highlight of my visit to the capital was going to the John Bellany exhibition at the National Gallery of Scotland. Wow! What an amazing artist he is. Three of my favourite paintings were ‘Eyemouth Boatyard’ because it reminded me of childhood holidays spent near there, ‘My Father’ because it was so alive with the artist’s father’s character and ‘The Obsession’ which was subtitled ‘Whence do we come? Who are we? Whither do we go?’ in which Bellany’s desire to know the meaning of life is grippingly portrayed. And there were so many other incredible pictures, from gorgeous Tuscan landscapes to gruesome Holocaust evocations – and some truly amazing ones done while the artist was recovering from a liver transplant and contemplating his mortality. Fabulous! And now, I’m back at school and enjoying seeing all the children and hearing about their Christmases. Some have had lovely stories to tell about their near misses almost meeting Santa Claus, hearing him on the landing outside their bedroom door or being certain they saw him cross the bedroom floor. Magic! AND – what could be more motivating for an insecure writer who sometimes wonders if she’s kidding herself about being a writer at all – than to hear (today) that I was shortlisted in the story competition jointly run by the National Library of Scotland, the Scotsman newspaper and Scottish Ballet. 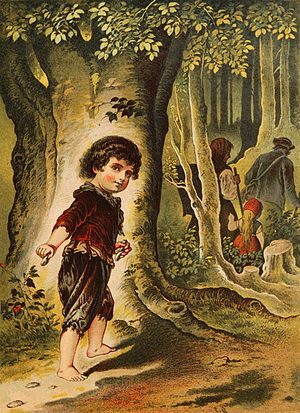 The brief was to rework the Hansel and Gretel story for an adult audience and to end it at the part where Hansel and Gretel go into the forest. It seems the judges liked my version. I am smugly but quietly proud. So here’s to 2013, thank you for reading my blog and happy new year to you all.